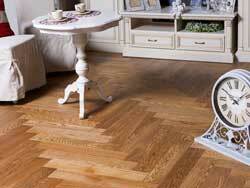 Herringbone floors have rich history as a traditional floor pattern in Europe. It can be installed in several configurations, with or without a border. 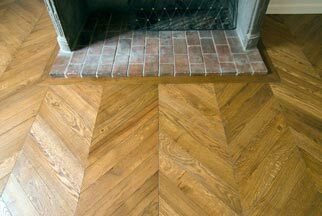 A popular variation of the herringbone, called Chevron or French herringbone, is prominent in many prestigious European Chateaus. Using a form below select the type of herringbone you wish to order. You may also order regular floor boards from matching wood by scrolling down the page to "Plank and Strip Flooring" section. Prices listed for unfinished, Select and Better grade, 3/4" thick boards. Standard option is solid wood board. Also available as engineered. 2-layer engineered floor is also available in 5/8". Thickness option will appear automatically when you select 2-layer in Construction option. 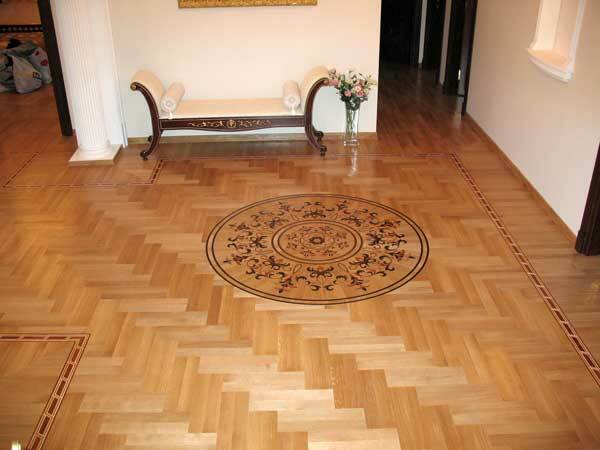 The minimum order for herringbone parquet flooring is 200 sq.ft. The herringbone flooring is sold in full bundles. The actual shipping quantity is automatically recalculated and rounded up to full bundles. After entering the required quantity, please click anywhere on the page or hit "Tab" to see the updated shipping quantity and total material cost. Consider using the Rift/Quarter sawn (R/Q) option for radiant heated floors, more formal look or if installing on concrete. Read more: Why choose Rift and Quartered floor. Another option for radiant heat is to use Engineered Floors. You may estimate the quantity by using our on-line Flooring Calculator or visualize and estimate your project using On-Line Floor Designer. Please make sure to account for waste when specifying the order quantity - It is typical to add 10% to 15% overage. Every Czar Floors Herringbone flooring is made to order, one at a time to your specifications. Please allow 3 to 6 weeks depending on the type, quantity and size before shipping. Completed orders will ship via LTL freight as palletized bundles. 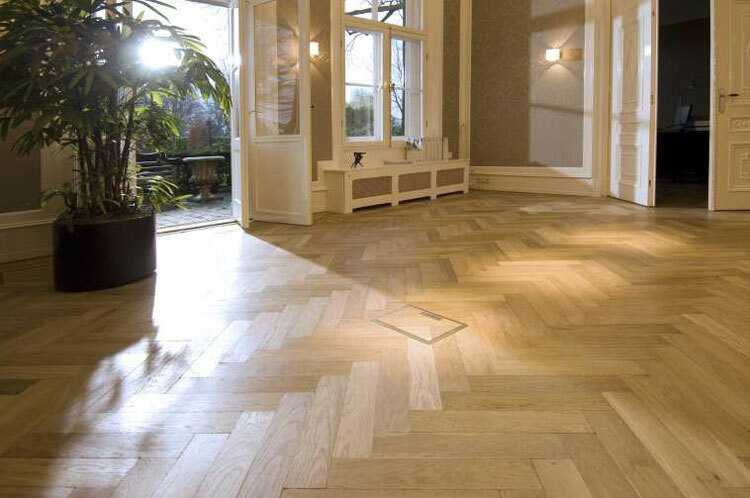 Herringbone refers to standard rectangular boards, all of which are the same size. It can be installed in diagonal or single pattern. 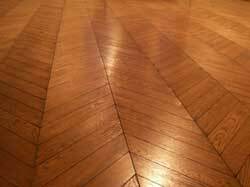 Chevron or French Herringbone refers to boards cut on both ends at 45° angle, measured from tip to tip on the same side. Double herringbone are rectangular boards made in three sizes, listing the largest size in the selection. Please see the patterns below for more information. 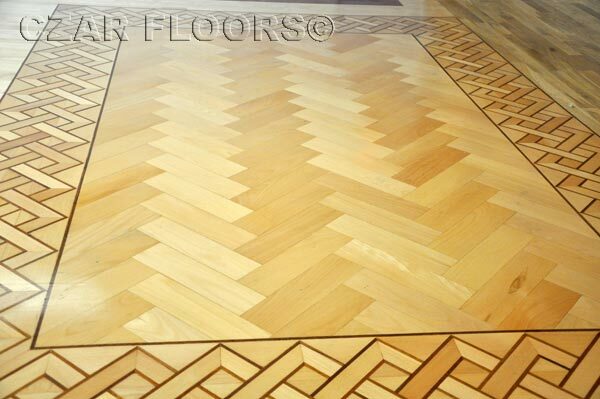 Maple herringbone, single plank layout with a matching decorative border. 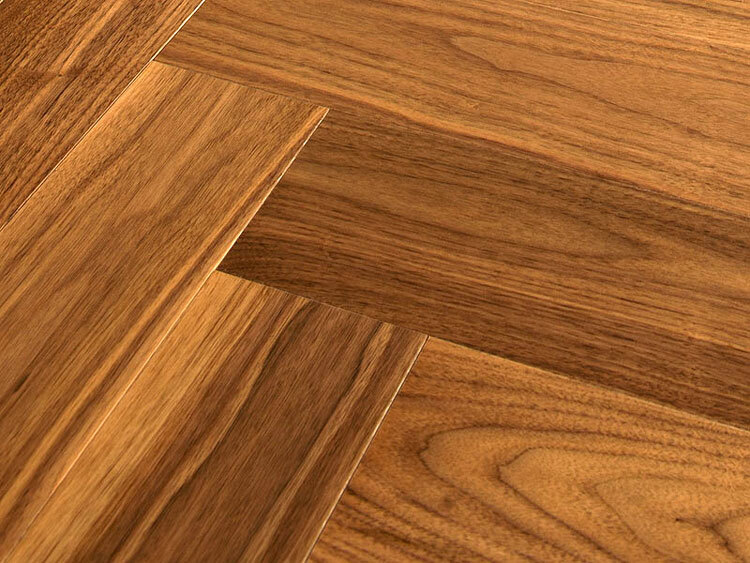 Herringbone flooring can be installed with double planks in the pattern. Czar Floors Herringbone is supplied as pre-cut T&G unfinished hardwood pieces -that can be assembled on site in different configurations. Herringbone floors are typically installed piece-by-piece in various configurations, either parallel to the wall or diagonally (as pictured above). Herringbone often looks best with the points running in the longest direction of a room or directed at a focal point. Diagonal installation visually expands the room, but requires more material - add at least 15% extra if you are doing this type of installation. 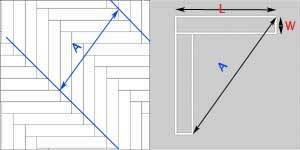 Sometimes you need to know the size of the repeating pattern to properly layout the room and select optimal board size. The handy calculator below allows to find those dimensions. Select the size of your herringbone from the list where "W" and "L" refers to width and length of individual pieces. Other dimensions A and B will re-calculate automatically. "A" for standard herringbone, "B" - for Chevron. 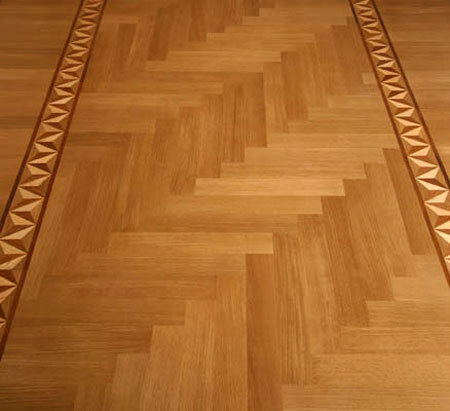 For the best results, the herringbone is installed by glue-down or a combination of nail-down and glue-down. Herringbone pieces have grooves on three sides and one tongue on the long side. It all starts with proper milling, more-so with a herringbone than with any other pattern. 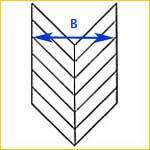 If multiple fillet widths do not exactly add up to the fillet length the pattern will be impossible to maintain. Czar Floors uses laser-guided precision equipment that are calibrated regularly to maintain consistent dimensions. Tolerance for dimensional deviation is not exceeding .005” in the width or profile of any one piece. Typical length of the boards in the bundle shown with average length. Length of the boards in the nested bundle is not guaranteed. All prices are for Unfinished, 3/4", T&G boards in Select and Better grade. Solid or Engineered. Please call for other grades. Lead time for custom milled boards varies and typically longer for wide ( over 6") and longer length boards. You may expect 2-3 weeks lead time for most flooring and 4-6 weeks for specialty order. Hardwood plank flooring, custom milled by Czar Floors, exceeds NOFMA and NWFA specifications. Our Select grade is similar to Clear Grade specified by NOFMA and NWFA. Czar Floors' boards are produced on German-made precision molders with human and machine inspection for knots and sap. All planks are back-channeled. Moisture content is between 6.5% and 8.5% and not more than 9% in any single board. Tolerance for dimensional deviation is not exceeding .005” in the width or profile of any single piece. Czar Floors white oak is the best quality Appalachian white oak (Quercus Alba) grown in the northern United States. Comparing to other white oak species this wood material has much more consistent color variation, tight grain, beautiful "honey" tone when finished. Solid Quarter or Rift sawn oak is a perfect choice for radiant heat flooring, due to its long successful history of use over radiant heated floors. Radiant floor heating, using solid quartersawn oak flooring, has always been a good selection for stability, especially when installing boards wider than 4 inches. With any floors - radiant or not - Rift/Quartered sawn oak would be the best choice and superior to plainsawn for a small increase in investment. Hardwood floor planks can be used to fill the areas between borders and walls with parquet installed inside the borders. This will create the beautiful appearance of a "wooden rug". 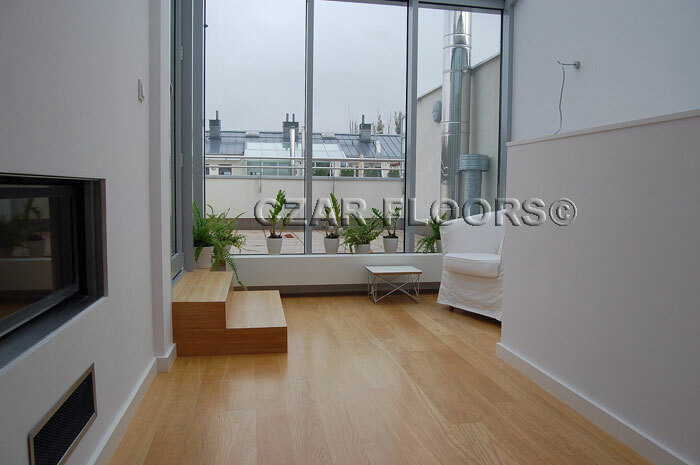 Czar Floor can supply quality plank flooring at competitive prices. The benefit of ordering plank floor from the same source as your parquet, herringbone, medallions and borders is that you can insure that it will match in thickness and appearance to other decorative floor. Please account for waste of at least 10%. You may estimate the quantity by using our on-line Flooring Calculator. The flooring is sold in full bundles. The actual shipping quantity is automatically recalculated and rounded up to full bundles. After entering the required quantity, please click anywhere on the page or hit "Tab" to see the updated shipping quantity and total material cost. If ordering with parquet or herringbone, there is no minimum - please call to order.